It's that time of year when we are on the lookout for holiday gifts. What would our loved ones like to receive? We have a great line up from some excellent companies this year in our annual Holiday Gadget Gift Guide. Hopefully this will give you some gift ideas. Eton FRX4 - This can help bring some fun and safety to your outdoor adventures. This multi-powered emergency weather radio does more than just that. With a digital tuner, flash light, and multiple charging options it seems to do it all. Check back for the full review the week ending 11/16/14. Eton Rugged Ruckus - Aptly named, this fun gadget can raise some ruckus while out in nature. This wireless speaker system will help you enjoy your times. The built-in solar panel keeps it charged, and can be used to charge other devices. Check back for the full review the week ending 12/7/14 . Alps Mountaineering Mystique 1.5 - If you like the outdoors and like backpacking, this small lightweight tent could be just the ticket. It is also well make, and ready for what nature may throw your way. And with vestibules, it will keep your gear dry as well. Check back for full review week ending 11/16/14. Alps Mountaineering Zion backpack - If your loved one is looking backpacking gear, this external frame backpack deserves to be on your list. It is durable and provides a lot of functionality. Check back for full review the week ending 12/7/14. Sigma ROX 10.0 Cycle computer - When it comes to cycle computers, they don't get much more advanced then this. The Sigma ROX 10.0 is called top of the line for a reason. Not only does it include the standard speed, distance, elevation. It also does cadence, and even comes with GPS build in! Check back for the full review the week ending 12/14/14. Sigma - If you are looking for lights on and off the bike, Sigma has you covered there too as well. The Sigma Siggi is a bike mounted light and the Sigma Topline Headled is a headlamp that fits around your head for easy hands free use. Check back for the full review the week ending 11/30/14. Magellan Echo - It seems like there is an app for everything these days, including exercise. But who wants to hold their smartphone while biking, jogging, etc. Let the Magellan Echo be your interface, and wear it on your wrist. Check back for the full review the week ending 12/21/14. Magellan Roadmate - Looking for all the bells and whistles in a GPS receiver? This one has it. In addition to getting from point A to point B, and access to millions of points of interest along the way, it even has a built-in dash cam. Wish you had one for your last accident? Not anymore if you have this! Check back for the full review the week ending 12/14/14. Harman Kardon Nova - So much is done on our smart phones these days, including music services. But have you tried listening through the built-in speakers? The Harman Kardon Nova has you covered. It is a wireless Bluetooth speaker system. It's big on sound, yet still small in size. Check back for the full review the week ending 11/23/14. GamersterGear- Who doesn't love gaming? But when it comes to gaming, so much of it is about the audio. It's not all about the graphics. And if you like your bass and explosions to be huge, this could be just the gaming headset for you! They actually employ dual drivers, using huge 57mm drivers for the bass! Check back for the full review the week ending 11/23/14. 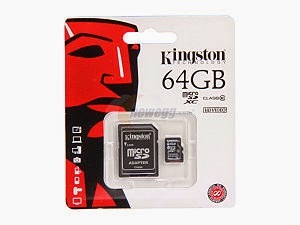 Kingston 64GB microSD card- Games, music, video.....they call can take up a lot of space. And cellphones and tablets are getting better and better, making it that much easier to want to bring it all with us on the go. So why not bring it all with you. The Kingston SDCA 10 64GB microSD card will let you do just that. Check back for the full review the week ending 11/30/14.